You'll discover tucked-away gems like Wangi Falls and Tjuwaliyn (Douglas) Hot Springs Park. 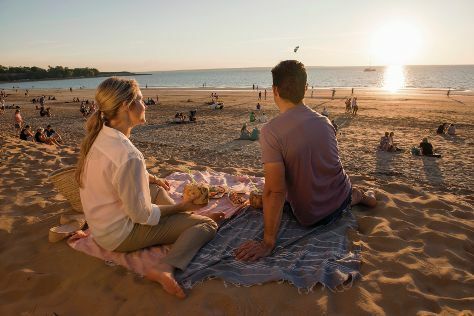 Explore Darwin's surroundings by going to Litchfield National Park (in Batchelor), Litchfield National Park (Buley Rockhole & Florence Falls) and Fogg Dam Conservation Reserve (in Humpty Doo). Spend the 21st (Thu) wandering through the wild on a nature and wildlife tour. Plan for a day of cool, family-friendly fun on the 30th (Sat) at Darwin Waterfront. There's much more to do: tour the pleasant surroundings at Mindil Beach, don't miss a visit to Nightcliff Jetty, stroll around Bicentennial Park, and see the interesting displays at Museum & Art Gallery of the Northern Territory. To see traveler tips, photos, reviews, and tourist information, use the Darwin online holiday planner . Adelaide to Darwin is an approximately 5.5-hour flight. You can also drive; or take a bus. While traveling from Adelaide, expect a bit warmer days and much hotter nights in Darwin, ranging from highs of 39°C to lows of 28°C. Wrap up your sightseeing on the 4th (Wed) to allow time to travel to Kilmore. Kilmore is a town in the Australian state of Victoria. Explore hidden gems such as Mitchelton Wines and The Shiraz Republic. Change things up with these side-trips from Kilmore: Nagambie (Lake Nagambie, Black Caviar Statue, & more), The Rockery Gemstone Museum (in Strathbogie) and Heathcote (Mount Ida Lookout, Sanguine Estate, & more). Next up on the itinerary: make a trip to Vietnam Veterans Commemorative Walk, do a tasting at Craiglee Vineyard, indulge your taste buds at Cope-Williams Winery, and take in the awesome beauty at Mount Macedon. To find reviews, where to stay, and tourist information, use the Kilmore online sightseeing planner . Explore your travel options from Darwin to Kilmore with the Route module. When traveling from Darwin in December, plan for a bit cooler days in Kilmore, with highs around 30°C, while nights are much colder with lows around 13°C. Cap off your sightseeing on the 18th (Wed) early enough to travel back home.